Why dont you download the insanely awesome yourkit EAP and see what difference is. It seems like no one in the Clojure world uses profilers.. I did - I have a full license. The results were inconclusive, although it did allow for a couple of optimisations. Profilers while useful, (I use YourKit frequently) are not a panacea for resolving performance issues. 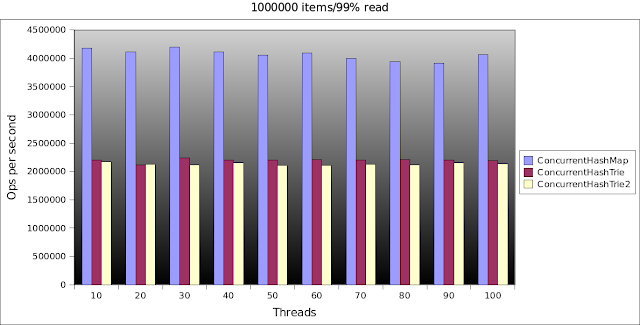 They tend struggle to identify problems caused by cache unfriendly code, lock contention (personal experience with this one) and cost of transitioning across threads. There are no failed experiments, only unexpected results. Thanks for sharing your experiences! I have been thinking about something similar for .NET but I think that other experiments now make it to the top of the list. A different approach to concurrent hash tries is taken here, and it seems to be very scalable and fast. Thanks for the reference. The CTrie looks interesting. 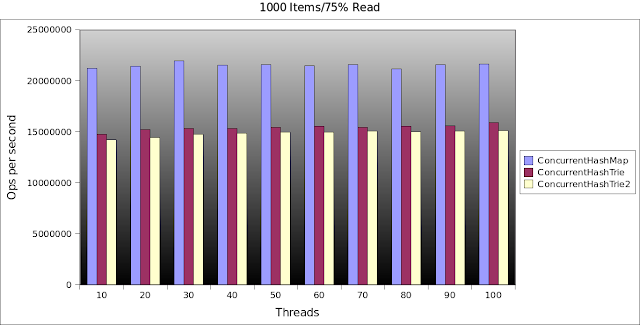 The ability to apply CAS operations throughput the tree rather than just at the root, will probably result in a lot less memory copying as the tree gets larger. So probably more efficient that the implementation that I presented.